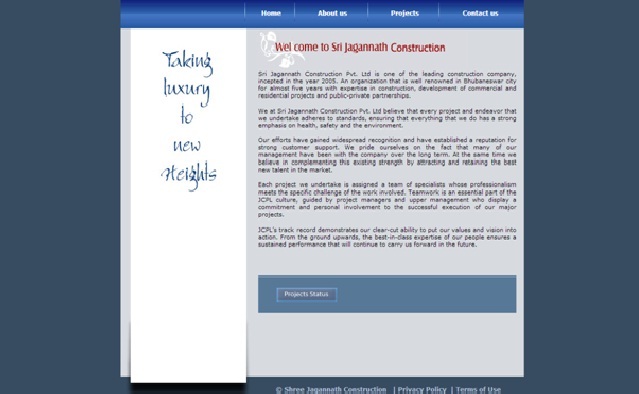 Sri Jagannath Construction, a leading Real Estate and Construction Company in the city Bhubaneswar, Odisha. This company provides all types of housing projects such as simplex, duplex, apartments, villas, and commercial complexes with expertise in construction, designing, planning of residential projects and public private partnership. This company has experienced professionals like Quality Civil engineers, Best Contractors, Best Supervisors, Best Sales Managers, Best Marketing Managers, and other Official Members. The aim of this company is to excellence in the field of real estate to provide quality services and customer’s support to their valuable customers. This project is located at Acharya Vihar, Bhubaneswar, Odisha. The specifications of this project are Doors, Windows, Flooring, Kitchen, Bathrooms, Toilets, External and Internal Painting and Overall Electric works. The features of this project are approved by BDA and Banks, Quality construction, Best location, Open car parking area, 24 hrs Water supply, Generator back up, and Security, Swimming pool, Community hall with air conditioned, Modern multi gym, ATM and Shopping complex. This project is located at Bhubaneswar, Odisha, India. This features of this project are Pollution free area, Open car parking area, 24x7 Water supply, Generator back up and Security, Telephone/ Cable TV facilities, Fire fight system, A/C community hall, and Sewerage treatment plant.